Godzilla stomps onto PS3 in what is a perfect example of a game that’s decent for the most dedicated of fans, but probably not worth a look from anyone else. After pushing myself through various phases of interest, annoyance, entertainment, satisfaction, and boredom, I’ve concluded that this game is great stuff for Godzilla super-enthusiasts, but not so much for me and, I imagine, not so much for Average Joe Gamer. The meat of Godzilla lies in Destruction Mode, the only mode available at the start. Godzilla goes into various settings and destroys however many generators are there, along with however many planes and tanks he damn well pleases. There’ll also be a lot of buildings leveled, intentionally and unintentionally. Such is the life of a giant warrior monster. 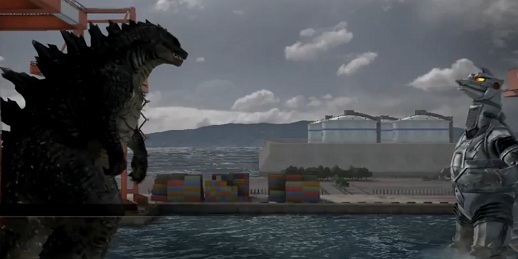 In some stages, other giant monsters come and attack Godzilla. Perhaps they did not get the memo that he is Godfuckingzilla? 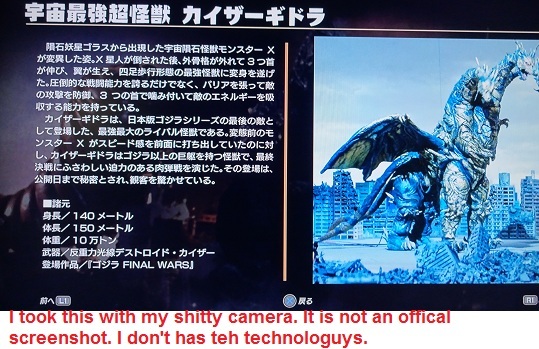 Mecha Godzilla and Super X are just a couple of the fools that Godzilla gets to teach What It Is. Whether fighting foolish humans or foolish rival monsters, the action and premise have inherent silliness to them that need to be understood. Godzilla is famously cheesy, and that’s a good thing. It should be embraced, so the best thing a modern addition to his legacy can do is run with it, and this game does that indeed. The graphics, while ugly upon first look and not at all among PS3’s best, still succeed at recreating something that looks like an early Godzilla flick (adapted for PS3, of course, where necessary). This same idea applies to the combat. Film Godzilla is generally a slow-moving monster with great power, but not great resp–er, agility. In the interest of authenticity, he’s also very strong but quite slow in this game. This leaves us at a crossroads. We have something quite authentic for franchise enthusiasts, but something that, honestly, gets pretty dull to play after a while; I’d expect the tolerance to be a little lower on those not super into Godzilla. If your just looking for a sweet action game, I recommend looking elsewhere. The combat itself, perhaps due to so relatively few things being like it, is pretty fun, especially at first. Seeing building collapse as Godzilla barrels through them, dropping Mothra like a ton of bricks, and powering through levels when death seemed imminent feel pretty darn good — for a while. It wasn’t too long until the short move list, constantly reused collapse animations, and general slow pace became tiresome. It didn’t help that the frame rate during battles would consistently get dropped, as if it were hot. Want to do a tail whip in the middle of a city? Get ready to see it like you’re watching a slideshow of dad’s vacation in 1974. Remember slides? Like, actual slides you looked at with projectors? 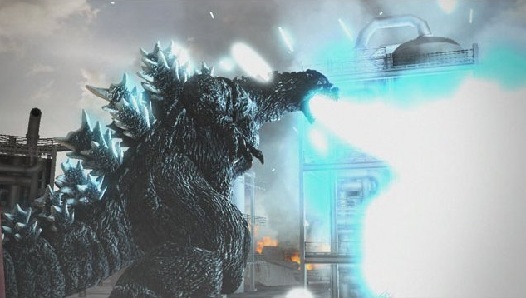 Godzilla’s PS3 game does, and its frame rate in urban areas will show you what they were like. There’s a lot of other little things that just reek of release being more important than gameplay. One that comes to mind is when Godzilla has to fight Super X and Super X2 at the same time, but one shows up a minute or so before the other. Both are given the exact same intro video upon their arrivals, with the music track resetting itself both times. That kind of copy-pasting, as mentioned above, adds to the hilarious cheese, but doesn’t exactly make for the most satisfying of games when used in excess. Players will go through Destruction Mode several times, as they’ll be allowed to choose different story paths and unlock more stuff as they do so. One of the first things unlocked is Evolution, in which players use items to embiggen Godzilla, modify his moves, and in other ways bring him closer to other forms we know and love. If you’re really, really into Godzilla, there’s diorama mode. This lets you take a clunky set of limited tools and struggle with them in order to make a sort-of cool looking still recreation of famous Godzilla moments or scenes of your own imagination. You won’t be able to produce what’s actually going on in your head, but hey, limitation breeds creativity, and there’s a whole lot of limitation to love with this feature. Mmmmm mmmm! If you like what you’ve made, you can take pictures and save them to your PS3. 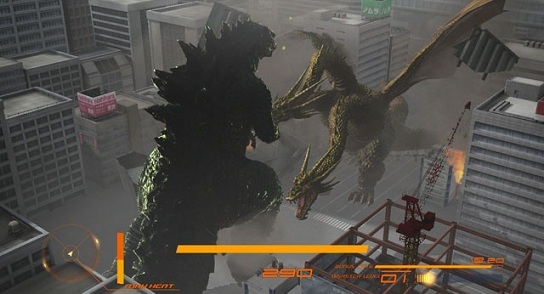 King of the Monsters mode has players taking the basic Godzilla (and later, others) and squaring off against other giant monsters in a sort of boss rush, sort of time attack battle gauntlet. Collect items and you can use them to make more progress in Evolution. This mode was fun, but second fiddle to Destruction Mode. The thing about Godzilla is that I did have fun with it, but it was for a pretty short time. Godzilla’s slow movement is completely justified for authenticity, and yet, paradoxically, doesn’t lead to long-lasting great gameplay. I excused the frame rate issues early, but they became more noticeable as things went on, and when later play revealed that there wasn’t much new content awaiting, interest waned. It’s a mile wide and a few inches deep, interesting to play, but doesn’t last long, and it’s nothing I can picture myself playing again in the future. PS3 version reviewed, as it’s the only version currently available. For information on scoring, please read our Review Policy here. As you can see in one of the slideshow images above, the title screen menu is already in English by default — options after that or within those menus are entirely Japanese. Godzilla is given commands during missions, entirely in Japanese with Japanese subtitles — no furigana. If you don’t understand these commands, I think you could still get by just based on assumptions. See a glowing orange dot on a map? Destroy that generator. See a monster in front of you killing you? Kill him first. It’s usually the kind of stuff you don’t really need to be told. …then you’re good to go. But if you can’t, then the only thing doing you any good will be the pictures. Godzilla is planned for a PS4 and PS3 release in North America in Q3 of 2015.